So she said " it is working well " did she ? Seriously what else would she say ? They set the circus up in the first place and brought in all the clowns they could find. What else would she say ? Watching the debate if you could call it that they all said the same things ...... one after another they announced their presence thus " I rise to speak" as Horace Rumpole would likely say if he witnessed the performances "just like alot of rice puddings" and one after another they repeated what those before them had said ......the good lady member for Ipswich mentioned "stays of proceedings " so I'm expecting some changes to the existing system...for better hopefully ....which we'll know once the amended Act gets the GG's seal of approval ...notable that neither Racing Minister Hinchcliffe or his opposition number John-Paul Langbroek made no contributions whatsoever. Delays in determining racing appeals at QCAT is a big problem with some 36 matters reported as outstanding by Nathan Exelby some weeks ago....this number may have been reduced since being made public ...or possibly increased .....but there’s no doubt the system needs a more efficient outcome.... as reported previously by my good self one recent QCAT decision took the learned member 4 months from the hearing on 15 November 2018 to when he handed down the decision on 18 March .....and that was only to dispose of jurisdictional issues with the nub of the matter still to be heard and determined ......but there’s worse as Richard Acland writing in the current issue of Justinian records there's a retired ACT Supreme Court judge who is still sitting on six reserved judgments ...some stretching back four-five Years ago. How pathetic is that. QCAT today lists two directions hearings Corey Bayliss and Jeff Lloyd both set down at 1.30pm same case number. 17/04/2019 1:30 PM Mediation Room 6, 259 Queen St, Brisbane. Maybe Immediation can help with some of these. ultra fast resolution for 10% by top legalese mostly retired now - a fraction of normal court costs - about time court costs got competition too! The stewards’ hearing into two charges around alleged uses of a jigger against Ben Currie will head into a second week after the matter was adjourned following evidence provided by the trainer from abroad on Wednesday. It is understood more witnesses could be called when the hearing resumes, possibly next week, pending their availability among the Easter Monday and Anzac Day (Thursday) public holidays. The charges relating to AR175(n) which relates to a person who “commits or commissions an act of cruelty to a horse, or is in possession or control of any article or thing which, in their opinion, has been made or modified to make it capable of inflicting cruelty to a horse” were dropped after submissions made by Currie’s QC Jim Murdoch. The charges remaining on the table still pertain to text messages where stewards allege Currie refers to the use of a jigger or electrical device in relation to two of his horses. The case now switches to QCAT on Thursday where Currie is seeking a stay on the suspension of his license. He is again expected to provide evidence via the phone. Murrihy’s affidavit was tabled to Currie’s legal team on the eve of the previously scheduled Stay hearing, which was later adjourned to Thursday. Unlike the stewards inquiries which weren't open to the press today's QCAT is open and it is expected the racing media will be present in force to make it to Hearing Room1 at 259 Queen St when the proceedings are listed to begin at 9.30am........with any luck those of us outside the circle will be told what happens...news hounds inc. They wont need to advertise when what they do is relevant or possible. Queensland trainer Ben Currie has told a stay application hearing he believed the words "harped" and "harped up" related to getting a horse primed to win and not an electric shock. Currie was giving evidence on Thursday by phone from Bali where he is attending a wedding . He is in the Queensland Civil and Administrative Tribunal asking that a stay order be extended to allow him to keep training until seven charges against him are resolved. Currie is facing 42 allegations but the hearing only relates to the seven charges which involve text messages which stewards say indicate Currie was using or instructing the use of an electrical shock device or jigger. Scott McLeod QC for the Queensland Racing Integrity Commission asked Currie if he had heard the term harped up in the context of an electric device. Currie said he had not and went on to say he used the term harped up or harped to mean a strong gallop or to fine-tune a horse to perform at its best. He told McLeod he had never used an electrical device or a jigger and has never had one in his stables or home. McLeod asked if Currie knew how a jigger was applied or used. "Not really.... I assume you push it into the horse. I wouldn't know where,"Currie replied. "It is useless. A horse can only go so fast. You can't make one go any faster." Currie said different people could have different interpretations of the words harped and harped up. "I have been saying they have multiple meanings," he said. There's an unconfirmed rumour that a group of local trainers who have been vociferous about the lengthy processes in the Ben Currie case have secured a meeting with RQ the rumour is they intend to threaten to refuse to nominate until the Currie case is dealt with....a form of secondary boycott possibly .......should be some news to confirm or deny later today. Trainer Ben Currie granted a further stay Ben Currie. Currie gave phone evidence on Thursday from Bali where he is at a wedding, during a hearing in the Queensland Civil and Administrative Tribunal (QCAT). He was suspended in February when stewards charged him with seven offences which were the result of text messages discovered on his phone. Currie sought an internal review and was granted a stay pending the result of that review. The internal reviewer found against Currie and he went back to QCAT to get a further extension of the stay. Currie faces 42 allegations in total and has also been training on a separate stay but Thursday's hearing only involved the seven charges from February. Some other charges are set down to be heard or finalised next week. Currie has not been found guilty on any of the 42 allegations to date. In agreeing to extend the stay order QCAT Member Steven Holzberger said on the balance of convenience he could see a clear detriment to Currie. "He employs 15 people and to not grant the stay would in effect shut down his business," Mr Holzberger said. "On the other hand I can't see to grant a stay undermines the integrity of racing." Much of Thursday's hearing was taken up with argument about the meaning of the words "harped" and "harped up" found on Currie's phone. Stewards have alleged the comments involve the use of a jigger or electrical device on horses. Currie told the hearing he had used the words to mean a horse was being primed or fine-tuned with a strong gallop and he had no knowledge of jiggers or electrical devices. He told the hearing he could not understand why anyone would use a jigger or electrical device. "They would be useless. A horse can only go so fast. You can't make them go faster," Currie said. "I have been saying they (harped and harped up) can have multiple meanings. Scott McLeod QC, for the Queensland Racing Integrity Commission (QRIC), made reference to 10 statements made by various jockeys and trainers regarding their understanding of the words harped and harped up. He outlined how they ranged from an understanding the words referred to a battery giving an electric shock to one who thought it was a musical instrument. "They demonstrate Currie is the odd man out in the racing industry. They are overwhelming consistent in what they had to say," Mr McLeod said. McLeod said Currie faced serious charges and for him to continue training undermined the integrity and image of racing. Jim Murdoch QC, for Currie, said it was important to note Currie had not been found guilty on any charge. He said stewards had tried to suspend Currie on only the charges and particulars not tested evidence. "The balance of convenience clearly falls in favour of Currie getting a stay," Murdoch said. The Queensland Civil and Administrative Tribunal has ruled in favour of Ben Currie continuing to train, with Member Steven Holzberger saying his ongoing participation does not undermine the integrity of the sport. Currie won a third stay of proceedings in the past 11 months at QCAT, after stewards suspended his licence in February, following the laying of seven charges against the trainer. The most serious of these included allegations of using a jigger, after text messages referring to “harped up” were discovered as part of the ongoing 2018 Weetwood Day investigation. Thursday’s stay hearing gives Currie the right to continue training until an appeal against an Internal Review decision on this matter is heard at QCAT. A directions hearing has been ordered. Trainer Ben Currie is free to continue training after the QCAT ruling. Currie gave evidence via phone from Bali, something Holzberger admonished him for, but ultimately determined did not affect his ruling. Holzberger said there was a “very heavy Balance of Convenience consideration” to Currie if he is ultimately cleared of the charges, given his the number of staff he employs and the likely loss of his business if he was stood down. “I can’t see how granting the stay undermines the integrity of racing, particularly when none of the charges have been proven,” Member Holzberger said. “I assume you just hit the horse with it and give it a shock,” he said. In explaining what he meant by the texts that included references to harp, Currie said there was nothing sinister. “Change our technique a little and fine tune him to get a result for the owner,” he said of its meaning. Ben Currie gave evidence via phone from Bali. McLeod later noted evidence given by a number of jockeys and trainers in what they understood the term harp or its derivatives to mean. McLeod submitted Currie’s explanation of what he meant by “harped up” was “utter nonsense when you look at the totality of the evidence”. “Mr Currie is the odd man out here. People who have worked in his stables have a very different meaning to harp,” McLeod said. Currie’s counsel Jim Murdoch said the explanations offered by the trainers and jockeys weren’t universal in linking “harp” to a jigger. The QC put it to Currie that Tom Button had said harp could mean jiggers or spurs, to which the trainer responded: “It’s similar to what I’ve been saying the whole time. It could mean different things,” he said. Murdoch said an affidavit submitted by Currie’s solicitor Michael O’Connor, which included sworn statements from James Orman, Luke Dittman, Luke Tarrant, Tom Button and Brent Evans was “compelling”. “Each and every one denied Currie had ever asked them to use (a jigger) or use it on his behalf,” he said. “There is an abundance of evidence from jockeys and trackwork riders that it didn’t happen. Ray Murrihy, a steward from 1970 to 2016, including the last 20 years at the helm in New South Wales, was present at QCAT on Thursday, but not called to give sworn evidence. Reference was made to his affidavit, where he stated he was familiar with the term harp and in his experience it meant to “impart a significant electrical shock”. He further stated in his time he had never heard harp used in the context of describing the training performance of a horse. Holzberger earlier dealt with his annoyance at Currie giving evidence via phone from another country, noting he did not have an order granting him leave before he went to Bali last Saturday. “That application caused me some irritation,” Holzberger told both parties. “It was a date Mr Currie asked for. The evidence by Currie on the telephone hasn’t assisted him and his approach to proceedings is cavalier. Nathan's report contains more information than the report previously posted. WAIT THERE'S MORE.....RQ issues Currie with a show cause notice . Racing Queensland is understood to have asked trainer Ben Currie to show cause why it should not refuse his nominations in Queensland. Currie has been a controversial figure in Queensland Racing and is facing 42 allegations, none of which have currently been resolved. 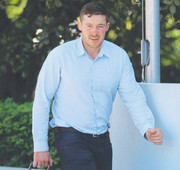 He has been training for the past year on two stays and got a further stay on some charges in the Queensland Civil and Administrative Tribunal on Thursday. It means Currie, who is at a wedding in Bali, is able to train pending further legal action. AAP understands on Thursday night RQ sent Currie and his lawyers a letter asking him to show cause by Friday week why his nominations in the state should not be refused. The show cause is under a modernised Australian Rule of racing AR55 which allows a principal club to refuse nominations without giving a reason. It in effect gives a Currie a week to show why he can continue training in Queensland. RQ’s chief executive Brendan Parnell did not return calls while a spokesman for Racing Minister Stirling Hinchliffe said he was unaware of the letter. Currie’s solicitor Michael O’Connor confirmed he had received a letter from RQ but said he could not comment further. Obviously QRIC wasn't kept in the loop QRIC Commissioner Ross Barnett issued his media release after QCAT granted a further stay of proceedings.......fancy just as the Easter close down bad timing lf his legal team intend to seek an injunction from the Supreme Court they'll have to wait until Tuesday unless there's access to a duty judge who probably wouldn't be too pleased to have his long weekend interrupted. Queensland is just so Queensland! Can an RQL administrator, frustrated, simply use a discretion to override a semi-judicial authority like QCAT? Can the minister direct RQL to act in a way they had chosen not to do? Does Queensland subscribe to the 'rule of law'? THE start of the phone hookup at Thursday’s stay hearing between Ben Currie and QRIC provided an anecdote that perfectly illustrates the circus this long-running affair has become. After being sworn in from his base in Bali, where he was for a friend’s wedding, Currie was asked by his legal representative Jim Murdoch if he had with him the affidavits with the relevant evidence for Thursday’s hearing. “No I don’t,” Currie responded. “I had to drive on a scooter quite a distance to be able to get phone service and I wasn’t able to bring that affidavit with me. Incensed, QRIC’s legal representative Scott McLeod tried to work out why the affidavits weren’t in Currie’s possession. “Correct me if I’m wrong, but I understood when you flew overseas you took with you your two affidavits? Was it impossible for you to have those in front of you today?” McLeod asked. As always, Currie had the answer. “The problem was I just moved into a new place for the wedding and I woke up this morning and thought I would have had phone service there and I didn’t, so I had to get on a scooter and go back into town and find service,” he explained. The fact Currie was overseas in the first place earned him a brickbat from QCAT member Steven Holzberger, who declared the trainer’s approach to the proceedings was “cavalier”. Holzberger said “the evidence by Currie on the telephone hasn’t assisted him” but flagged the likely outcome of the hearing by adding, “I don’t think it will affect the final decision”. It didn’t, with Holzberger making a clear ruling in Currie’s favour to grant him a stay and continue training. That paved the way for a new chapter in the saga, with Racing Queensland hours later issuing the trainer with a show cause notice as to why they shouldn’t effectively ban him from racing in the state. That scenario will come to a head on Friday. In the meantime, Currie will face stewards again on Wednesday in a continuation of two charges alleging the use of a jigger. That still leaves charges 1-28 from May last year and the seven charges issued in February unresolved, along with the five swab irregularities, which date back to 2017. If that’s not confusing enough, there’s also a directions hearing looming to kick off proceedings around the suspension of his licence, for which he secured the stay on Thursday. And the RQ AR55 move is also certain to end up in the courts. For his part, Currie continues to staunchly plead his innocence and vigorously fight all allegations. Murdoch said the charges laid by QRIC did not paint the picture of a person who was systemically using “such devices”. “These are taken out of many thousands of text messages,” Murdoch said. Murdoch said Currie had not been found guilty of any of the seven charges, nor any of the charges laid against him over the past 11 months. “Ultimately, there has been no hearing, Mr Currie has not been found guilty of any charges and he is entitled to a presumption of innocence,” he said. I don't think Nathan is in Currie's corner the intro suggests that.... but I make no cticism of him for that ....no other journo went into that detail in reporting on the QCAT hearing......not having brought the affidavits was just a side show to the main event....it didn't go anywhere.......anyone as close to the proceedings as Nathan is wouldn't be normal if he didn't have an opinion ...earlier it was reported that former RNSW Chief stipe Ray Murrihy was present at the QCAT hearing having submitted an affidavit as to his opinion on the meaning of the words "harp and harped" ....he wasn't called to give evidence on how he came to that conclusion...no doubt Jim Murdoch QC would have asked some pertinent questions and for detailed information on any cases which the experienced former chief steward could cite where it was found those words involved charges and/or penalty for being found in possession or use of a jigger. T WOULD be interesting to know if anyone inside the walls of Annastacia Palaszczuk’s Government noticed the irony in the pressure placed on Racing Queensland last week to act on the Ben Currie saga. Not so long ago, the Alan Mac-Sporran-led inquiry into greyhound live baiting, which turned into an upending of all three codes of racing, recommended the splitting of the integrity arm of the industry from the control body. The theory being that integrity needed to be a separate consideration to commercial interests. Yet last week we had the Racing Minister Stirling Hinchliffe pushing for the control body to act on an integrity issue. The much-lauded MacSporran recommendations, which were adopted lock, stock and barrel by the government, are proving to have plenty of shortcomings. The integrity system Queensland racing is operating under is an unmitigated disaster. It’s going to take a lot more than a few tweaks with the QCAT model to fix it. The internal review is treated as a speed bump and serves no purpose other than to stretch proceedings out. Compare the Queensland system to what happens in NSW. Mark Zahra was suspended last Saturday at Randwick and the appeal process is taken care of inside a week, costing him the ride on Santa Ana Lane in Hong Kong. Had the suspension been in Queensland, Zahra would have had his stay rubber-stamped at QCAT, been straight on the plane to Sha Tin and then returned home to be sweet for the entire spring carnival as well. Here in the Sunshine State, Mark Currie was disqualified for two years in May last year and his appeal is only due in QCAT next month. In a sport that so heavily relies on integrity, a 12-month time span (at the minimum, given the QCAT ruling will probably take another 2-3 months after the hearing) is totally unacceptable. Bonnie Thompson QCAT decision confirming QRIC Internal Review decision 7 days suspension this process has taken from 15 May 2018 to 1April 2019. to be resolved. TRAINER Eric Hayes is the latest licensee to win an appeal at QCAT, after having a penalty for presenting a horse with an elevated TC02 reading quashed at the tribunal. The case revolved around the levels of Hayes’ horse Sonador Fire after tests exceeded the allowable limit of 36 millimoles per litre in plasma. The rules provide a 1 millimole leeway, effectively meaning 37 is the limit. Stewards fined Hayes $2500 after finding him guilty under rule 178AA, because they were satisfied the trainer had “administered alkalising agents within the one clear day period”. He was not charged under 178C, which deals with the TC02 level. Expert evidence was provided for stewards that the probability of a normal horse returning the Sonador Fire level was between 0.18 per cent and 0.58 per cent. QCAT member Glen Cranwell ruled that “based on the evidence before me, I consider that the most likely explanation for the laboratory results is simply that Sonador Fire was one of the 18 to 58 horses in every 1000 (that) would return those results”. Cranwell said Hayes presented as “a truthful witness” and his evidence was not seriously challenged on cross-examination. The QCAT decision reported above in today's SM has not yet been publicly displayed on the Supreme Court website ......his case went before QCAT on 28 March after he was fined $2500 for a TC02 positive way back on 19 August 2017 from Sonador Fire which was barely over the limit ......the stewards dealt with the charge on 29 January 2018 quite incredible that it's taken so long to get to the final arbiter. There was a report last year that the Victorian Guvment had legislated to remove VCAT from the appeals system to create a specialized body specific to the racing industry..which is possibly what the Hon. Hinchy our Racing Minister is contemplating.